"A floating stronghold for facing the siege of the oceans." 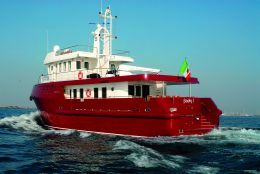 Designer Stefano Faggioni's words are certainly weighty, yet they marvellously describe the feeling of an explorer vessel built for one of the greatest personalities in the history of Italian scuba diving. Length on waterline: 21.80 m.
In the history of yachting there are many vessels whose names, for one reason or another, have been strictly linked to their "traditional" owners. We need only think of Onassis' Cristina, Khashoggi's Nabila, Agnelli's Stealth. It's a sort of chemical phenomenon involving, in equal measure, the magnificence of the shipbuilding and the prestige of the owner. The result, almost always, is an indissoluble connection. We were lucky enough to witness this concomitance of factors right from the start when, in the course of an interview, Stefano Carletti told us of his intention to have a boat built in order to return, thirty-nine years after the event, to the place where his international fame as a diver began: a point in the Atlantic Ocean, about 20 miles south of Nantucket, where the wreck of the Italian turbine steamship Andrea Doria lies. Because in summer 1968 Carletti was part of the team of divers who made the first documentary about the sunk ship. At the end of shooting he personally fixed a heavy plaque to the vessel, bearing the words: "We came here to work in order that the impossible could become possible and the Andrea Doria return to the light". "Now it's clear that the ship is destined to stay in the abyss forever," Carletti told us, "I've decided to go and get that plaque back". There was something truly exceptional about the 1968 mission, starting with the diving gear which was practically the same as what was used for sport diving in shallow waters: compressed air bottles, neoprene dry suits, standard regulators. But the group consisted of expert athletes, young and well- trained. Now, on the threshold of his sixty-seventh birthday, Carletti demands - justly - to return to the cold murky waters of Nantucket with quite a different set of equipment. Starting with the support vessel, which is as special as might be imagined. His project was named Naumachos, after the boat he had sailed around on in his youth, and after the title of the fine book - just reprinted by Mursia - which he wrote about his diving adventures in Sicilian waters. This makes us imagine just how much pathos had an underlying and therefore important role along the delicate passage from initial idea to technical project. And it also explains how come Carletti, who had a clear Socratic concept of his ship in mind, hadn't found even one - in various yards worldwide - that came up to scratch. Hence the inevitable decision to create something new, out of nothing. Precious partners in this gestation were Sergio Cutolo for the engineering and Stefano Faggioni for the design. No better choices could have been made, also in terms of personal sensitivity in bringing together the owner's ideas. Cutolo had always entertained the idea of such a vessel, but without ever being aware of it. Faggioni, in his own words, at once thought of "a floating stronghold for facing the siege of the oceans". 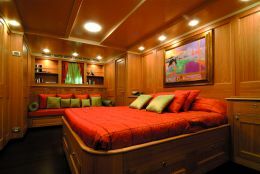 As for the shipbuilder, it certainly had to be a yard accustomed to building working vessels but also capable of prompt responses and flexibility with regard to the needs of yacht design. There was an immediate understanding with Cantiere Navale di Pesaro chief Ennio Cecchini: Naumachos would be ready in roughly twelve months. 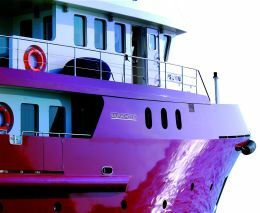 Today, seen with the eyes of someone who expects a motoryacht suitable for work, Carletti's new vessel appears highly original. 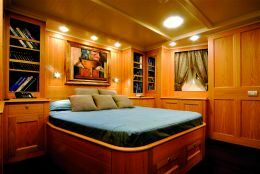 But actually the exact contrary is true: the Naumachos 82 is a working vessel conceived for the most professional use imaginable, with certain amazing top class yacht features. You're actually tempted to call her "cultured", precisely for her ability to transmit the same sense of mature wisdom that characterises her owner, a learned man who is animated by the curiosity typical of great explorers. The displacement hull is 24.50 metres overall. The main engine, a 550 HP Baudouin, gives the boat a maximum speed of 11 knots at 1.900 revs and an economical cruising speed of 9 knots. So she can cover a distance of 4.500 miles in 500 hours of sailing, and under all sea and weather conditions. All in all, the design category "A" occasionally loses its bureaucratic flavour and finds full realisation in a vessel which - just to give one example - can cross the Atlantic at any latitude. 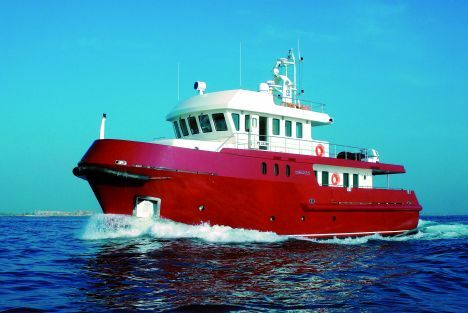 Hull and deck are in steel while the superstructures, which have the vertical development of the "fortress" conceived by Faggioni, are in light aluminium alloy. 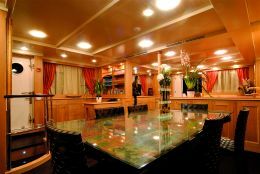 Even our visit aboard had something special, original, about it: instead of beginning with the prestige areas and cabins - a protocol beloved of those who concentrate more on décor than on any other feature - we set out from the engine room, accessed from the aft bridge. We like to imagine that this is the operational centre from which the next mission to the wreck of the Doria will be directed. And in fact, as soon as we crossed the threshold of the watertight door we found ourselves in the area that houses the diving gear - including a hyperbaric chamber - and the auxiliary engines. In the next room, separated by a fire door, everything centres revolves around the main engine. The choice of a Baudouin 6M 26 SR was based solely on pure statistics: in its power category of around 500 HP it is the working engine least subject to breakdowns of any kind. The cleanliness that reigns in the engine room suggests an operating theatre - but in an avant-garde clinic. There's no vital or secondary element of the various systems that cannot be easily accessed for inspection or repair. Greatest attention was paid to the fuel supply system, with awareness of the fact that 90% of engine breakdowns are caused by the quality of diesel arriving at the injectors. Practically speaking, the fuel is treated in a sort of purifying unit that makes it very pure indeed, even if dirt or water - for various but far from rare reasons - has entered the great 30.000 litre tanks. In logical sequence our visit continued to the bridge, though crossing the saloon to get there gave us a sample of the refined good taste reigning in the so to speak residential areas. Needless to say, the wheelhouse is at professional level with the instruments clearly visible from every position. 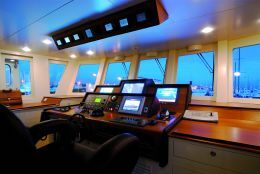 Centralised control of all functions by means of a complex computer network is carried out from a touch-screen monitor, so you can intervene immediately on each system, from fuel to water management, from fire-fighting to the ship's lights. Moreover, a high definition video, hooked up to an omnidirectional camera oriented with a joystick, keeps every corner of the engine room under observation. You can even zoom in on the equipment meter readings. 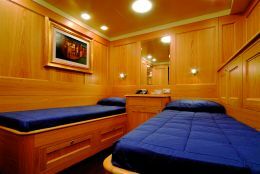 Although it may seem strange - especially to those who don't know the owner personally - there's a close stylistic coherence between the functional sophistication of the technical rooms and the sober elegance of the saloon and cabins. The fact is that Carletti is equally at ease amid the tubing of a Diesel-dynamo and in the austere rooms of an English gentleman's club. He has therefore put his signature to every square inch of his new boat. 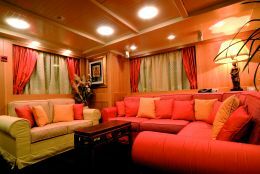 The interiors are divided with view to accommodating, on two separate decks, eight guests and four crew. So the cabins are all below deck level where the oscillatory movements of the hull are less evident. Moreover, the vessel has an anti- roll system with four active fins that is effective even at anchor. As for the style of the furnishings and their precious ethnic accessories, the photos speak clearly. But nevertheless there's something that photography absolutely cannot transmit: the smell of oak - the main wood aboard - and of cedar, used for lining the wardrobes, drawers and cabinets. At this point it is permissible to wonder to what extent the highly personal imprint of Carletti's boat - which, by the way, is called Bodry 1 - will be reflected in the subsequent development project. Well, since the charter version already exists on paper - for twelve passengers and five crew - and since the 115 foot model will be launched by the end of 2007, it's clear that the customised philosophy will remain an integral part of the Naumachos programme. Which is to say that substantially each individual vessel will continue to express the magical dual concept which, as mentioned earlier, indissolubly links the name of a great boat with that of her prestigious owner.